A rooftop pool with amazing sea views, an enviable location close to a number of tourist spots and the presence of Central Plaza within 200 meters are the highlights of this hotel. The staff is courteous and even offers a welcome drink on arrival. The rooms are spacious and you can enjoy an uninterrupted wi-fi connection as well. Sea Me Spring Hotel Pattaya is a 3-star hotel in Pattaya that offers comfort and luxury at an affordable price. It is a luxurious boutique hotel located just a few minutes walk from the beach and has been rated one of the best locations in Pattaya. The hotel offers a sophisticated shelter for couples/honeymooners and business travelers looking for a perfect vacation. The hotel features a rooftop pool, outdoor pool, spa and massage centre for its guests to calm their senses and enjoy the stay. It also boasts of its attractive interiors and advanced amenities. Further, its warm hospitality and sophistication helps offer their guests a memorable and perfect stay. Its proximity to the nearby tourist attractions like Central Festival Mall, Walking Street and a 20 minute drive from Utapao International Airport adds to its popularity among the tourists. Sea Me Spring Hotel Pattaya boasts of a friendly staff and a wide range of spacious rooms which are completely furnished with different sea views. The rooms offer sophistication like none other with signature beds and touch-screen phones for managing virtual office. All the rooms have large windows offering panoramic views of the city skyline. All the rooms feature air conditioning units, flat screen LCD TVs, surround sound systems, tea and coffee makers, electric kettles and slippers. European standard bathrooms with bath tubs and separate shower areas feature in the hotel rooms. All the rooms have private balconies. Also, most of the rooms are 45 sqm in area. Business amenities include cordless phones, work desks and chairs. Offering the utmost luxury and comfort, Sea Me Spring Hotel Pattaya leaves no stone unturned when it comes to catering to its guests. The hotel has everything guests would want while in Pattaya. 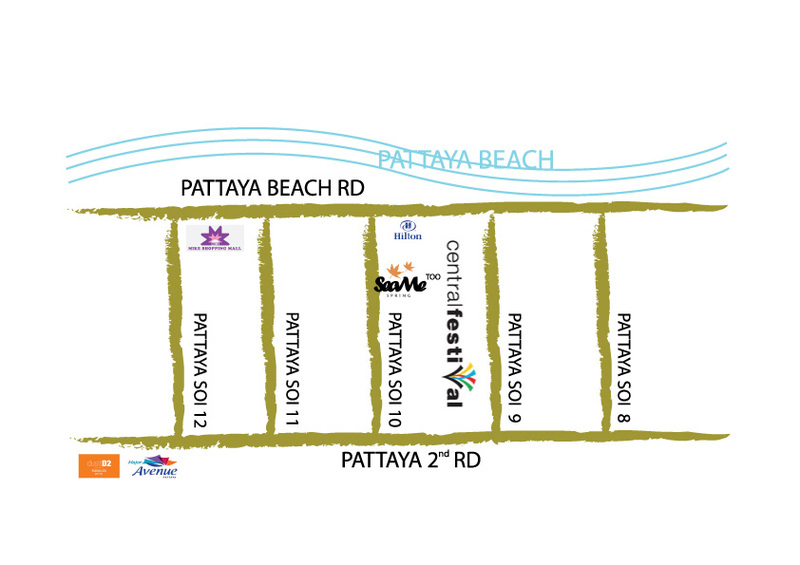 It is nearby popular tourist places, such as Pattaya Beach, Central Festival Shopping Mall and Walking Street. Being one of the best hotels in Pattaya, it makes sure that a certain standard is maintained that the guests will surely appreciate. Does the hotel feature a restaurant? Yes, the property boasts of a restaurant that offers Thai, Asian and International cuisines. can pick up service be availed from the airport? Yes, the Sea Me Spring Hotel Pattaya provides airport shuttle services to its guests at an additional charges. Does Sea Me Spring Hotel Pattaya offer and spa and massage services? Yes, the hotel offers in-room spa and massage services. Is there a private balcony and sitting area? Yes, each of the rooms features a private balcony with ample sitting area. Does the hotel provide arrangements for differently-abled guests? Yes, the hotel makes arrangements for differently-abled guests. Guests staying at Sea Me Spring Hotel Pattaya can enjoy the warm welcome and hospitality offered by the hotel staff. The property is a boutique hotel that makes up a perfect choice for couple and family travelers in Pattaya. When it comes to sophistication and comfort, there is nothing that the hotel does not have. The hotel provides one with the modern classic style experience. It offers the peak of luxury and fine living experience. The hotel has friendly staff and because of its high standards and warm hospitality they are dedicated to making sure that they preserve the environment. Guests can experience the best mesmerizing views of the surroundings and have a relaxing night in the hotels pool bar. For families traveling with children, the hotel can arrange for babysitting services and provide baby cots as well. Guests are sure to have an amazing experience and make unforgettable memories during their stay at Sea me Spring Hotel Pattaya Thailand.